In another life I spent 34 years working in education heading a P.E. Department, as a Boarding Housemaster and as a Senior Teacher but throughout that time I was always involved in Hill Walking, Mountaineering or Climbing, both personally and as a leader, working in the Lake District, Scotland or abroad during my school holidays. Increasingly towards the end of my teaching career, I was spending more and more of my time in this way – and so 5 years ago I gave up teaching altogether and committed to the outdoor life completely. Though based in the midlands of England at present I spend most of the year travelling, working and playing in the mountains of Britain and abroad. I have a grown-up family of three daughters who similarly are fully involved in outdoor life – walking, climbing and crazy downhill bike racing. Whilst I am happy in any mountainous region – I am most at home in the Cairngorms where I can roam for days on end, staying high and remote in some of the wildest and most inspiring mountain scenery in Britain. I am also a semi-professional folk singer/guitar player who loves to link his hillwalking and leading to his music. There’s nothing nicer than ending a few days walking with a few good songs – particularly if they are closely connected to the area that you have just walked in! 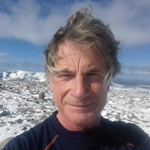 I have spent over 30 years developing a great love of and knowledge of the mountainous regions of Britain – having completed all the Munros – and the English, Welsh and Irish 3000s by 1996. I have enjoyed numerous climbing and walking trips in the Alps and have lead a large number of expeditions abroad in mountainous and jungle areas. I have climbed – both in winter and summer- in various areas of Britain. So hard to say – I have led a number of incredible 3 or 4-day treks in the Drakensberg mountains of South Africa. As a teenager, I hitched over 3,000 miles across the U.S.A, across 26 states from east to west, down the west coast and back to the east across the southern states. All in less than 4 weeks! It’s an amazing way to get to meet and know the people of a country. In 2004 I took part in the well known Welsh 3’s challenge – (covering all 14 3000ft. summits in North Wales in one continuous walk) but I – and a couple of others – did it twice -back to back – a long walk – 33hours! In 2017 I published my own book on the Cairngorms – part guide, part story, part thoughts.